Cook chicken adding little pepper powder, turmeric powder and salt. Shred it and keep it aside. Heat little oil in a pan, add chopped onion and saute well. Add ginger, garlic and green chillies and saute well. Add shredded chicken, pepper powder, garam masala, salt and coriander leaves, mix well and saute for few minutes. Remove from fire and keep it aside. Remove the brown layer of the bread slices. In a blender, add eggs, milk, bread slices and salt and blend it very well. Heat a non stick pan, add ghee and pour half of the bread-egg mixture and cook for few minutes. Then spread the prepared chicken masala on it and then the remaining bread -egg mixture. 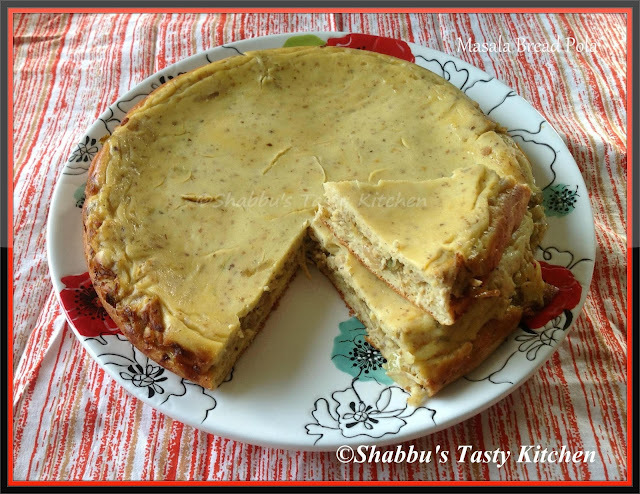 Loved this idea Shabna, yummy and very tasty pola. Bookmarked it. Will try it soon. Very interesting dish, quite new for me..
Never tried making anything like this!!! :) Would love to do it soon..